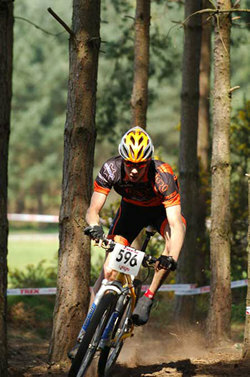 Sherwood Pines played host to the opening round of this year’s 2006 NPS Cross-Country series and duly provided more tension & drama than an episode of Eastenders. 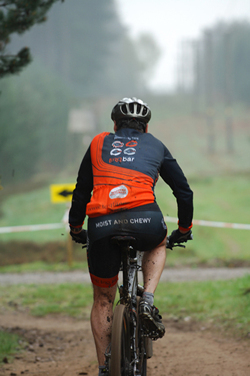 Torq riders were in abundance, mixing it with the best, as each category brimmed with talent & expectations. A classy group of strong juniors were the first to tackle the 7.5 miles loops of fast dusty trails and killer singletrack, including Team TORQ/Kona rider Jay Spetch. Unfortunately for Jay a technical hitch at the start of his race nearly made him miss the actual race. Starting from the back of the grid, he nearly came a cropper as the first crash of the race happened just in front of him, surely nothing else could go wrong! But as they say bad things happen in 3’s and Jay came a cropper in the tight singletrack, losing even more time. Eventually disappointed he came home in 3rd after a hard battle to gain all that ground. Dave Fletcher took the win. As midday neared, the elites, expert & sport classes started to assemble on the starting grid. The depth & strength of the Elite race was awesome, the cream of British cross-country racing side by side. Oil Beckingsale, keen to do well on home soil after the stunning start to his season headed the line up. Alongside, were more commonwealth riders; Si Richardson, Steve Roach, Gareth Mongomerie, Rab Wardell & James Ouchterlony, plus the perennial Nick Craig and ever promising youngsters Phil Spencer & Stu Bowers. Tucked up amongst this classy field were Torq riders, Nick Collins, Marcos Schier, Scott O’Neill & Simon Burgess, a hard race lay ahead. The race itself started like an intercity train, destination non-stop, and no passengers. By lap one 15 riders had got away from the huge field of 60 starters, This group stayed together for 3 laps, with Beckingsale biding his time, calculating when to attack. He launched a number of skirmishes to test the water, before finally committing to an attack on the 3rd lap, which left everyone standing. Beckinsale cruised to the line with a minute’s advantage to take the win. Meanwhile Wilkinson & Collins were battling out behind, with Wilkinson kicking 1/2 lap from home, leaving Collins unable to respond, Wilkinson took 2nd with Collins taking a well earned 3rd. 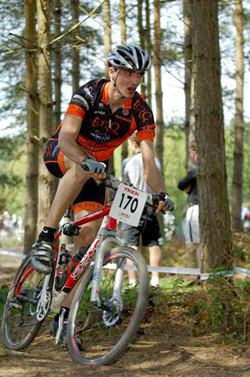 Simon finished in 38th spot, despite a brilliant start, which saw him battle it out in the top 25, for most of the race. Marcos was close behind in 45th. 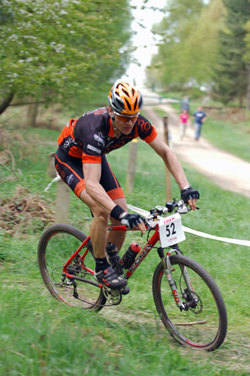 Again the Expert field attracted a large entry, of quality riders, including, Team Torq riders, Mark Russell, Anthony Rowland, Steve Shaw & Eric Pettett. The pace was fast from the gun and again a group of riders managed to break from the large field and made a bid for freedom. 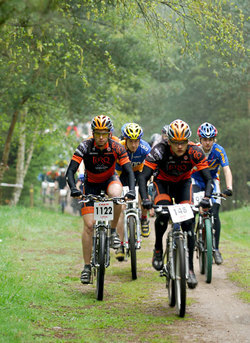 Luke Moseley, Mark Russell, Scott Macrae & Paul Priestley & Paul Beales, making the race from the front. Just 25 secs separated the first 4 finishers, and as the finish line loomed ahead, a nail biting sprint was in the off, with Mark leading it out. Unfortunately a clash with a post put paid to a fantastic finish for Team Torq/Kona, with Mark being narrowly beaten to the win by Moseley. Anthony had a tough race, sitting outside the top 10 for the first half, but gradually worked his way through the bunch, working hard with Rob Lee – Extreme Endurance, who in the end just pipped him to 5th place. But still a good finish for Anthony with a worthy 6th spot in a very classy field. Steve, newly moved up to the expert category, rode his own race, testing the waters and his fitness after a hard ride the previous week at Enduro 6. The pace and stamina of the experts took him by surprise, but it was a great learning curve and we’re sure he’ll achieve even better results later in the series, than his 20th spot here. 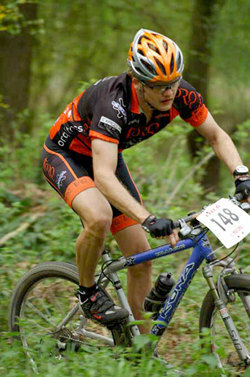 Eric came in for another great ride, resplendent in his Team Torq kit for the first time, ratching up 21st place. The master’s race was yet another fiercely fought competition, with nothing to separate the top riders on paper. Again the pace was awesome as they battled for position, even if the previous sunny condition were now replaced with drizzle. 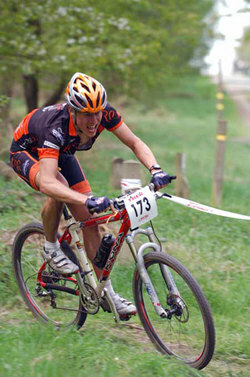 Simon Turner – Ellsworth/Freeborn/Torq, was taken by surprise at the ferocity of the race. Fortunately the good training he’d been putting in over the winter stood him in good stead as he reeled his competitors in, only conceding to cramp towards the end of the last lap. Still he managed a fine finish in 12th spot, which would have placed him 5th in the Expert race. 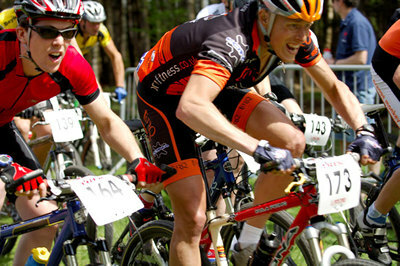 The depth and breadth of racing just didn’t stop at the men’s racing with the women’s races attracting quality riders. Lydia Gould Team Torq, once again dominated the vet’s women’s class and National Champion Jenny Copnall – Gary Fisher took and equally easy win in the elites. It really was a good day out for the Torq Team, being in the thick of the action, providing some of the best racing you could hope for. Cross-country racing is alive and definitely kicking, with the NPS providing a worthy battle ground for all our champions, current and those yet to be discovered, hopefully one of them will be in Torq kit. A real bad start to the NPS round one with a technical hitch causing me to almost miss the start! As one of the last to go off at the starter gun it’s not really the place I wanted to be & to make matters worse there was a crash in front of me just after start line. Losing so much time at the start I had a task to fight my way through the field when disaster struck a second time! Problems in the single track resulted in a crash and more lost time, hence only 11th place at the finish line. Disappointing result but really looking forward to round 2 at Margam and getting a much better result. Nicely surprised by the large field, and was keen to see who was now in expert after the cat. movements from last year. I thought it was a good fast flowing course, a day for the big chainring! You really needed to be in a train of riders, which for most of the race I was. Loads of guys went of so fast and I was probably out of the top 10 for the first lap or so, but riders started to blow as myself, Rob Lee and the Kona/Paligap rider worked well together and pulled back riders with good maintenance of lap times. By lap 4 we had caught up to 5th place and a bit of cat and mouse stuff started, to see who would take 5th to 8th. I went to the front and put in some pace which dropped of the Kona guy, then swung of and sat behind the unknown third man with Rob dropped in behind. I opened the sprint to the arena and only Rob stayed on, who then attacked again. Coming into the last wooded section after the feed zone, Rob cleared a back marker who was then on my race line, impossible to get pasted and Rob got 3 seconds over the line, lucky for him there was that backmarker! I was hoping to come into some form for this weekend. Having put in a lot of base miles in until late on in the spring I had been lacking speed. So I lined up with a fast looking masters field looking to stay with the back of the leading or inevitable second group. But the race was manic and I lost touch with the leading two groups and work away with the third. On the third lap I still felt good so put the effort in the catch the group in front. Another chap came with me and we reeled in the group, pick one guy off, but I then had to back off on the last fire road a twinges of cramp set in. The mental pace of the race was revealed when the results were out and my time for twelfth in Masters would have been good for fifth in Expert! Got to be happy with that. The elite race got off to a fast and furious start, no rider wanted to give an inch and the competition was fierce for every inch of track. The course itself was pan flat and loose and twisty, the fire roads were like mini time-trails and the headwind made itself felt when leading. 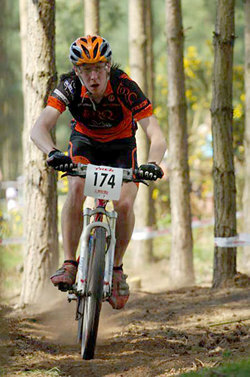 I started well and made my way up into the top 25 I think, but faded later in the race. I couldn’t pin point what was up, but my legs felt tired and lacking in top end zap, especially when I finished a close second here last year in the experts. 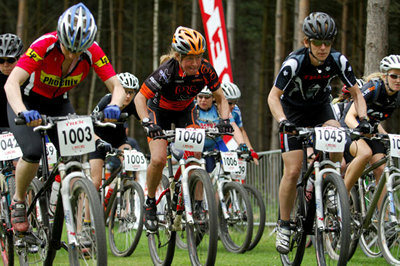 I was a bit nervous on the start line; it was my first expert race since moving up from sport last year. I recognised a few faces from sport last year and just hoped I wouldn’t be last really. Eventually the gun went and we all zoomed off, I just had in my mind “damage limitation, don’t blow” so I decided to sit at my own pace and let the others race off at their own speeds hoping that it was too quick. Unfortunately what I quickly realised is that in sport you can get away with it, but in expert about umpteen people will come past you! I ended up by myself (exactly where I didn’t want to be) and managed to be with a bunch of guys from last years sport class who were a bit slow in a group but if I upped the pace then they just sat on my tail so I was in a lose: lose situation. I came in 20th so I wasn’t too disappointed, my rear mech was playing up jumping a lot on the last lap and my legs were a tiny bit heavy from the Enduro Plus the weekend before. I noticed that Peter Humphries (RAF) was 2 places ahead of me but the rest of the sport bunch were behind. I was quite tired at the end and I didn’t blow so put it all down to experience. I wanted a fast race and got it riding all the way round with master rider Michelle Bergstrand. We were pressed by 3rd placed master in the early part of the race but upped the pace and dropped her. I came in first to win the vets race, well ahead of 2nd place finisher. The day after the NPS XC round riders were treated to the chance to pit themselves over an extended version of the XC course, testing themselves over 6, 4 or 2 hours depending on what challenges they fancied. The course itself took on Jeckle & Hyde characteristics as it’s previous dry, dusty trails, were transformed into slippery mud & sandy gloop which coated everything; riders tackled the course with brakes on self destruct & Vaseline sales hitting the roof. Also many competitors had been lulled into a sense of false security from the day before and were still running semi slick tyres, a few laps later as the rain pelted down there was a made scramble for the pits and hasty tyre changes, helping them to avoid body/tree interfaces as the trails got even trickier. Ryan Henry proved the man to beat in the 6hr solo. Gavin Rumbles & Ellsworth/Freeborn Torq rider, Simon Turner did what they could but they couldn’t match Henry’s relentless pace. Simon confident his form was spot on after an excellent ride in the Gorrick 100km, stuck with the leaders and for 3 hours it worked perfectly. The next 3 hours were hell, as the conditions worsened and things got rough, including the skin/saddle interface apparently! Still he finished in a creditable 3rd after a tough ride in harsh conditions. Meanwhile Team Torq riders, James Lister & Ian Barrington, were hot on the heels of the 6 hr leaders, until disaster struck 4hrs in and Ian had to abandon his ride. James meanwhile, just seemed to get stronger as the race progressed, picking off riders as the race progressed and despite managing to break a wheel in the closing stages, still finished in a fantastic 4th spot just fractionally behind Simon. A very young but ever so talented Felt team stitched up the 6hr team race, beating on their way, probably the tallest team in the sport, XCracer.com. whilst Raleigh were close behind in 3rd sporting a couple of their talented junior girls. 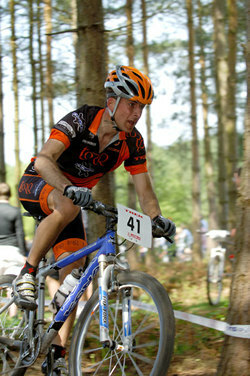 Torq Team leader Matt Hart managed to sneak away from professional duties to ride a lap or two, for a team consisting of Thetford MTB racing’s Paul Sumption, Sophie Caley & Mike Jones. Completing 8 laps in the time allowed to finish 4th. Zak Toogood and Will Bjergfelt once again showed their pedigree, taking an easy win in the men’s 6hr pairs, despite a challenge from team mates James Williams & George Richardson. 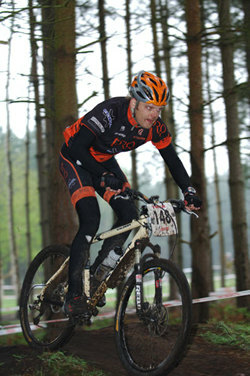 Team Torq rider Steve Shaw teamed up with Trans Alp competitor Julia Richardson. A tough day lay ahead for the 2 and a new experience for both, 6hr enduro pairing. The conditions took their toll on both man/woman & machine, but they soldiered on recording 9laps and eventually finishing in 14th position. Another great day’s enduro racing, despite the weather, but that’s the joy of mountain biking in the UK, you never know where your challenges are coming from one day to the next, you just know they going to be great. 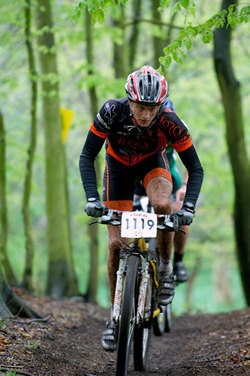 So having ragged myself on Sat it was time to see how fit I really was with the six hour enduro on Sunday. Feeling confident after my third place the week before in the Gorrick 100km I set off to try and stay with the leaders. Although the Ellsworth Truth was awesome over the somewhat bumpy course after a flying first three hours the last three were a suffer fest. The mud got worse – never easy with a semi slick rear! – the sand ground everything, including my arse! Crossing the line on the same lap as the winner, in third place in 6hrs 30 – I was very pleased it was over. I went first out on the course, it was similar to the NPS course, very harsh on the arms and legs with no let up and a stinging head wind on the open fire road. We did the first lap quite fast but when I came to hand over to Julia I quickly realised that we had to change the damned number, Julia had got some tape to bodge it and I found a better solution while she was on her lap. I got to lap 3 and by then the course was getting quite muddy and slippy with the rain still coming down, the Hutchinson Pythons were beginning to lose their advantage on the hard packed stuff compared to the muddy sections, the rear mech was getting worse despite the AQR guys having a look at it, and I also didn’t want to ruin my brand new XTR and Crossmax wheels! I changed to the Caldera, which felt much better, a lot of people were dropping out with backache but my USE XCR carbon post seemed to be helping me no end. 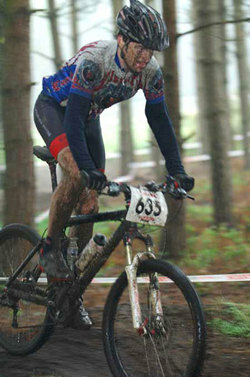 I was wrecked at the end of my last lap and the conditions had become really bad – it reminded me of Plympton last year. It took me about 3hrs to strip clean and rebuild my bikes, but at least I found the shifting problem on my Kula Primo, I had bent the chain and pulled half of a link off a pin – SRAM chains – keep going even when they’re broke!